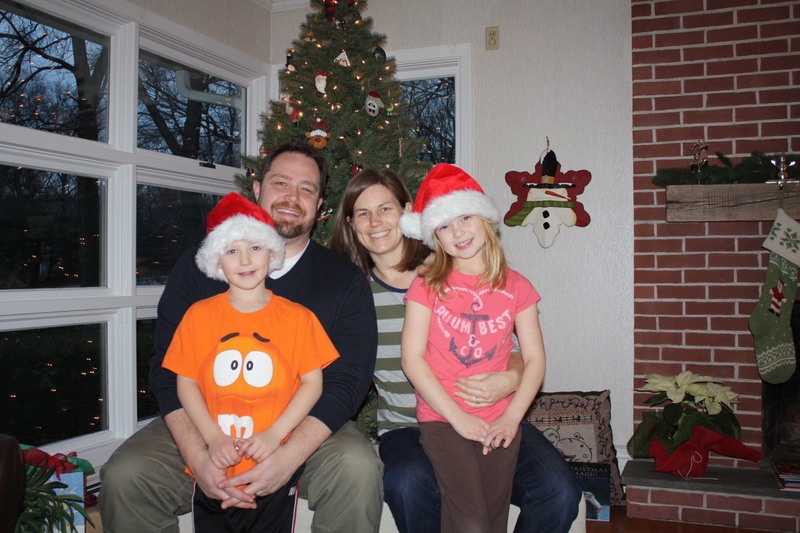 It seems like Christmas was forever ago, so doing a Christmas post in mid-January seems odd. But it’s what time has allowed me, so here we go. 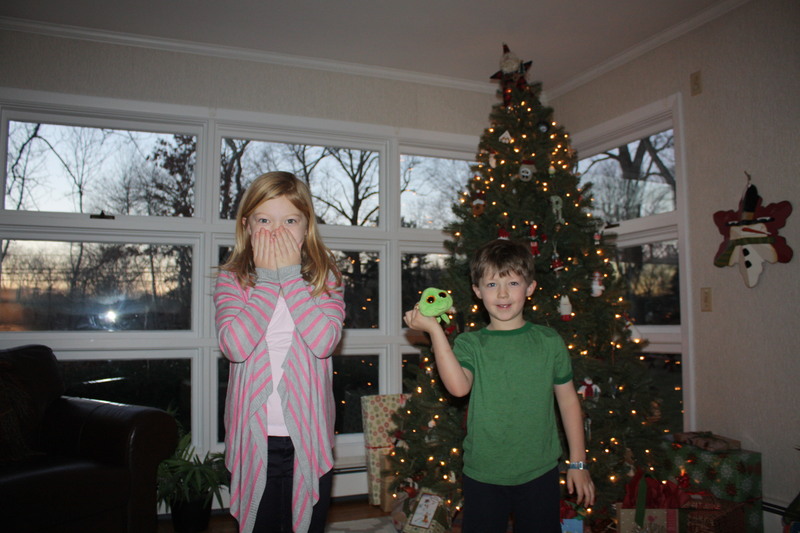 After enjoying our first Christmas morning in our new house, we drove to Maryland for Christmas #2 at Nana and Papa’s. Luckily there was little to no traffic, so we arrived in just six hours. Phew! The kids were a bit tired after a day in the car, and I could tell they had wanted to play with their new toys at home more. 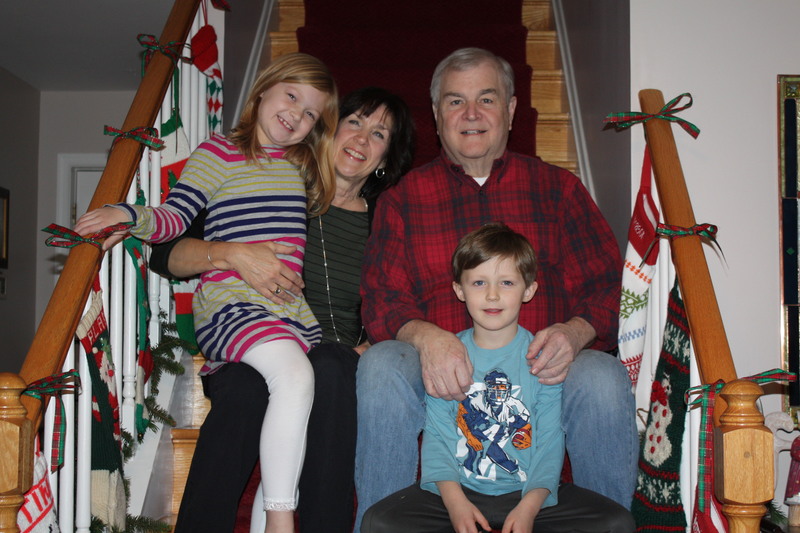 But when they saw the presents under Nana and Papa’s tree, they quickly forgot about all that and were ready for the next round. More presents = more fun! 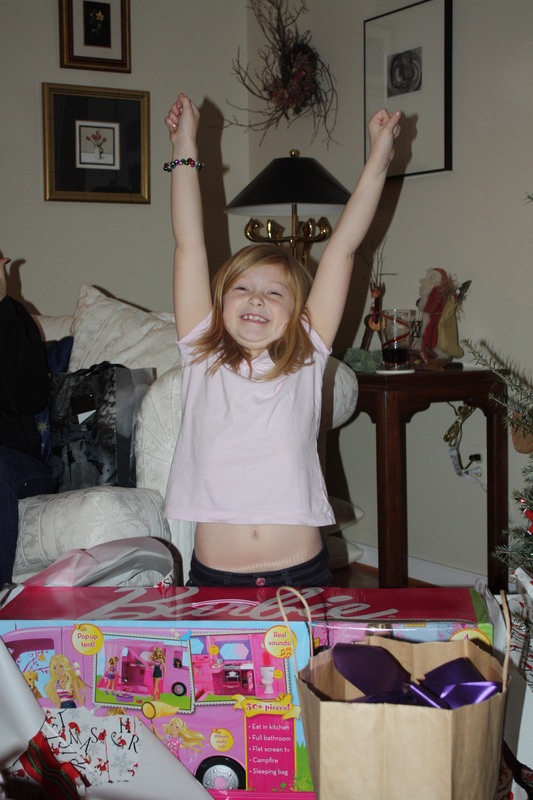 Mason was over the moon to receive the Barbie camper she had been coveting for a while. 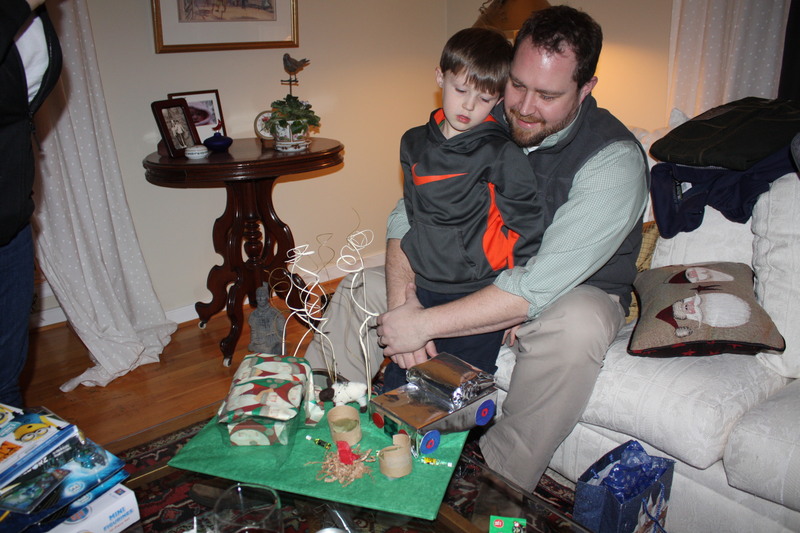 Cooper and Jeremy admiring the crafty work of Kristin’s wrapping masterpiece. 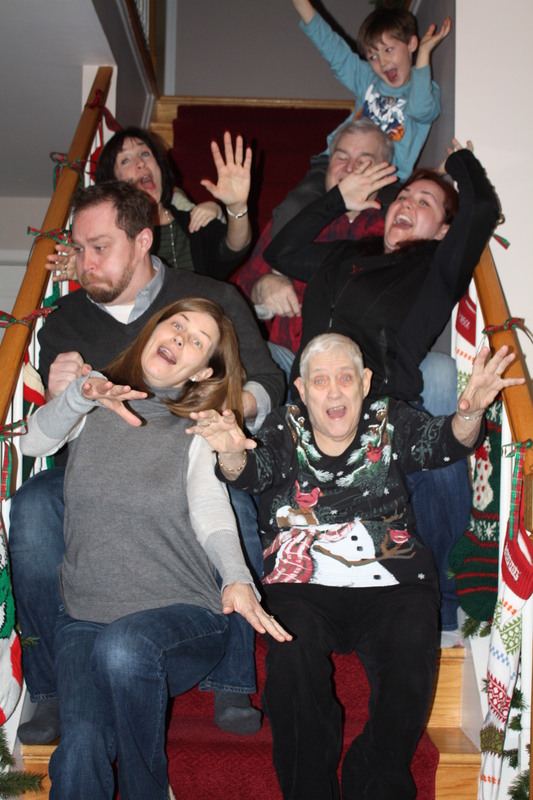 After lots of unwrapping, it was time for the annual Christmas Stairs photos. When I first set up the tripod and timer, I accidentally set it to the continuous shots. We realized that quickly, but decided to keep it for the next round. 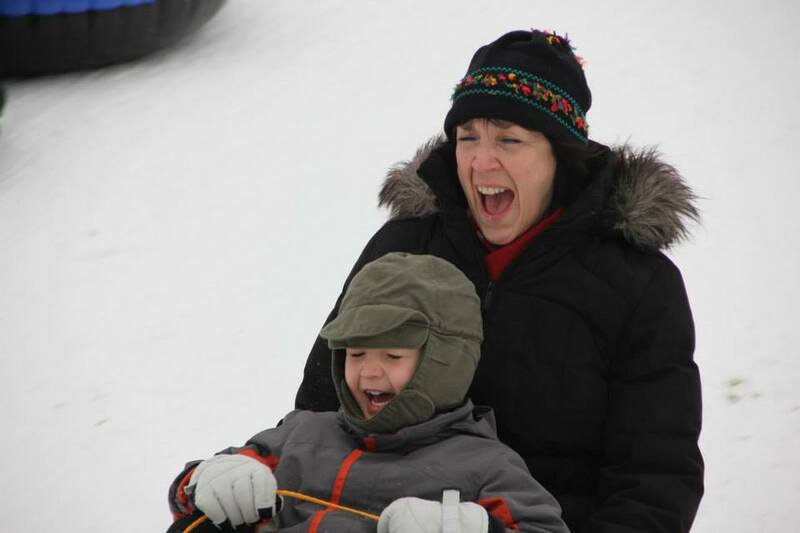 Jeremy’s instructions: Pretend we’re on a roller coaster. Below are the last 2 of the 5, but enough proof that everyone got in on the fun. 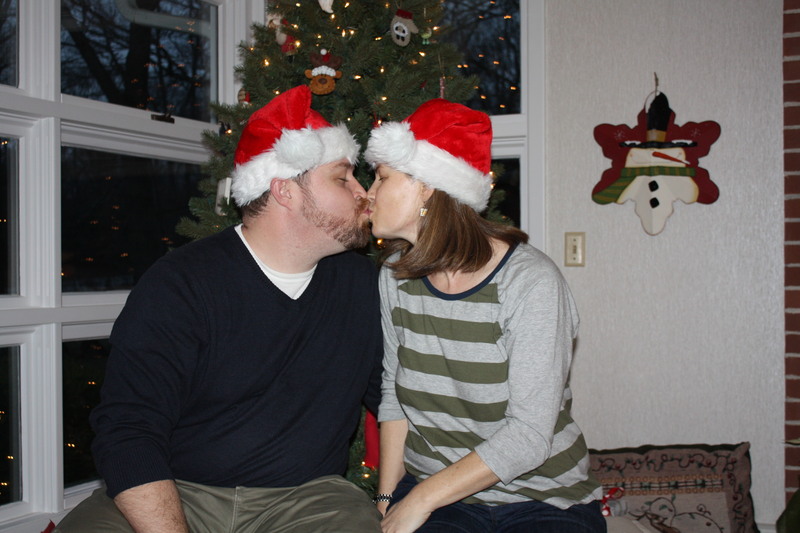 We did manage to settle down and get some real pictures. After a couple of days of relaxing, watching Despicable Me 2 (finally! ), catching up on HGTV, and eating (Have you tried Trader Joe’s Jingle Jangle? It’s addictive so watch out! ), we managed to get out to the real world and meet up with friends. It’s always nice to have the chance to connect with old friends, so we’re especially appreciative when they make time in their busy schedules to hang out with us. All in all, this leg of the trip was a perfect 2nd Christmas. So what could be good enough to follow it? Round 3! 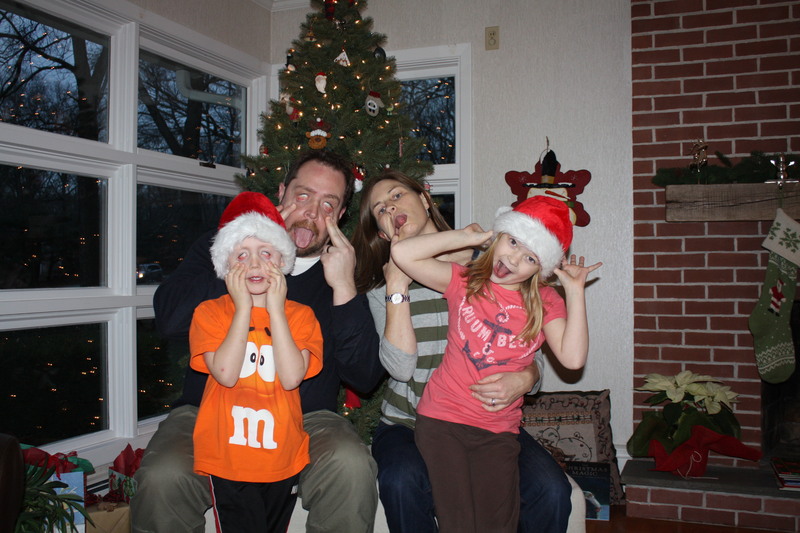 Stay tuned for the next and final installment of The Christmas Post. 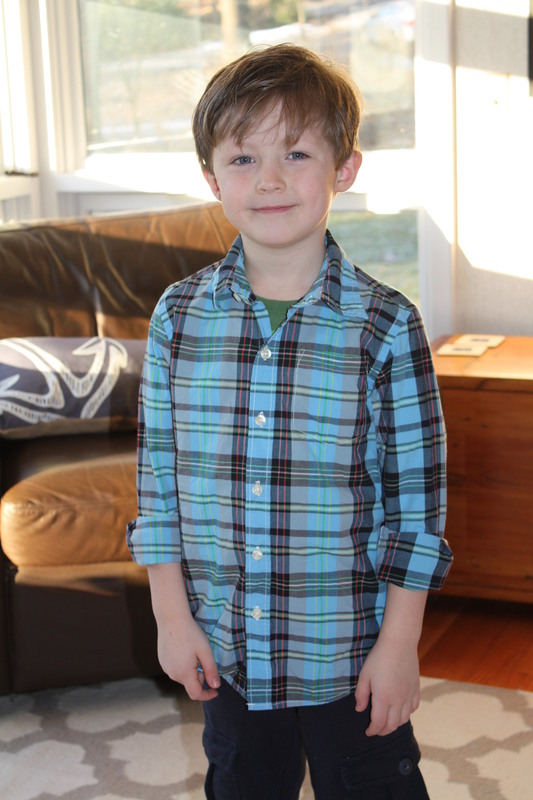 How did this boy get to be six? I can’t even believe it. He needs to still be my cuddly little boy. He needs to stay like this forever. I can’t deal with him aging. Ok, that’s not true. I actually can’t wait to see him grow up. I think it’s going to be quite an adventure! 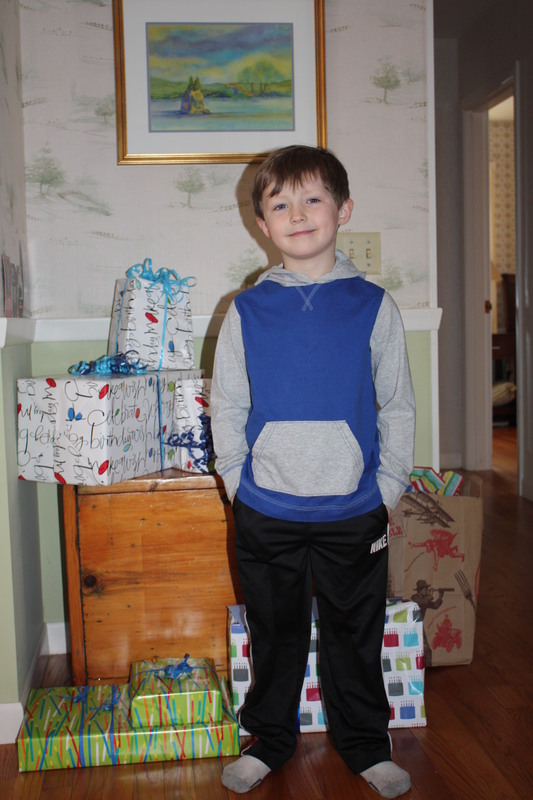 So I interrupt the previously scheduled Christmas Post #2 to share the details of Cooper’s birthday. It spanned over 2 weekends and was quite fun. First up was his actual birthday weekend. Sadly it coincided with a winter storm that caused many delays. Kristin was delayed in Baltimore for almost 5 hours. Papa luckily got on an earlier delayed flight as standby – otherwise who knows when he would have made it to Providence! And with the 6-8 inches of snow and the polar vortex of freezing cold weather, we stayed inside most of the time. But we made the best of it. We went out for meals, rested a bunch, did some crafts, and played on the Wii. 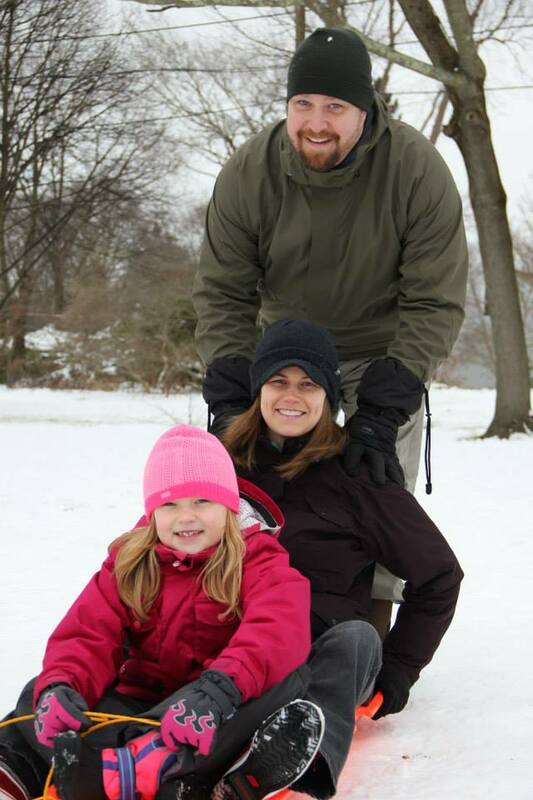 And when it finally warmed up Sunday morning, we HAD to get some sledding in. Good times. 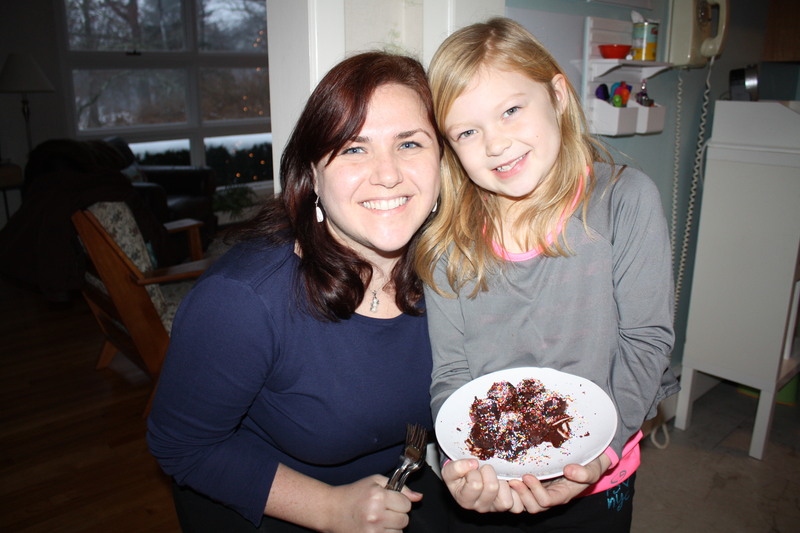 Easy Bake Oven treats hand-crafted by Mason and Kristin. And yummy chocolate cupcakes as requested by the birthday boy. Even I got in on the fun. With the family birthday celebration over, it was time to start preparing for Cooper’s birthday party with his friends. 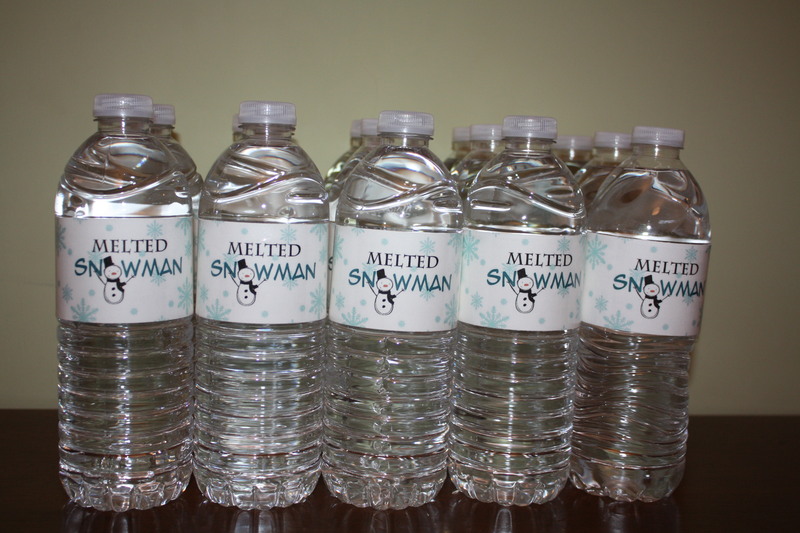 He had been insistent on a Frozen-themed party. We adjusted it a little bit to be mostly about snow, snowmen, and winter with a little bit of Olaf in there. (If you haven’t seen Frozen yet, it is worth it just for the laughs Olaf, the snowman, brings!) Cooper was hoping for snow for his party so we could be outside and build snowmen with his friends, but the day of his party was actually very warm and rainy. Not quite the winter wonderland. So we brought winter inside! 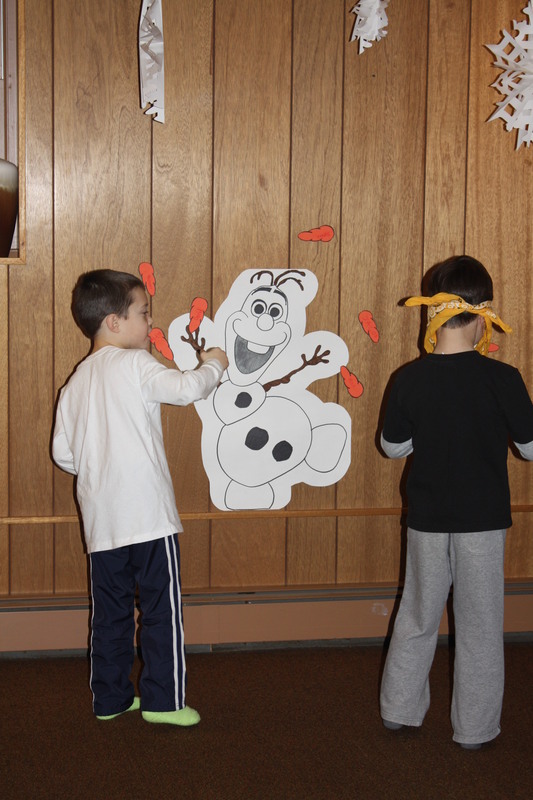 “Pin the nose on the snowman” game. Not pictured was the Snowman Bowling Game. 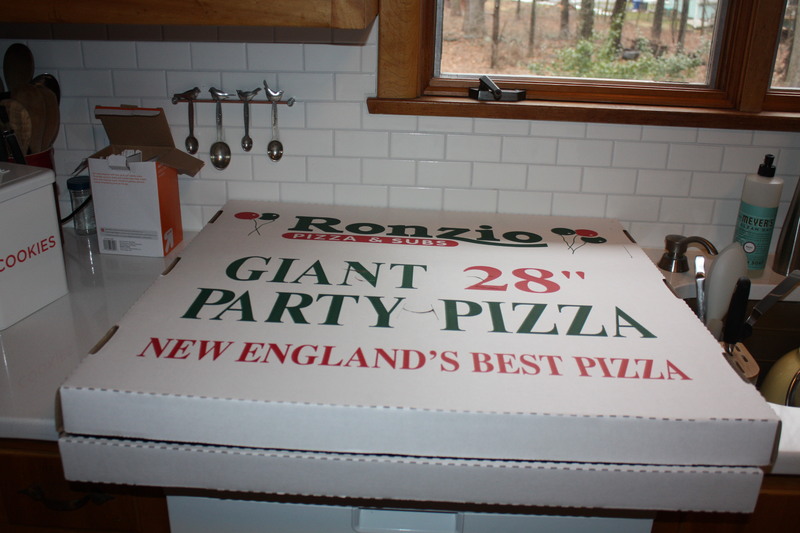 And no party is complete without a GIANT pizza. Seriously, this thing barely fit through the door! 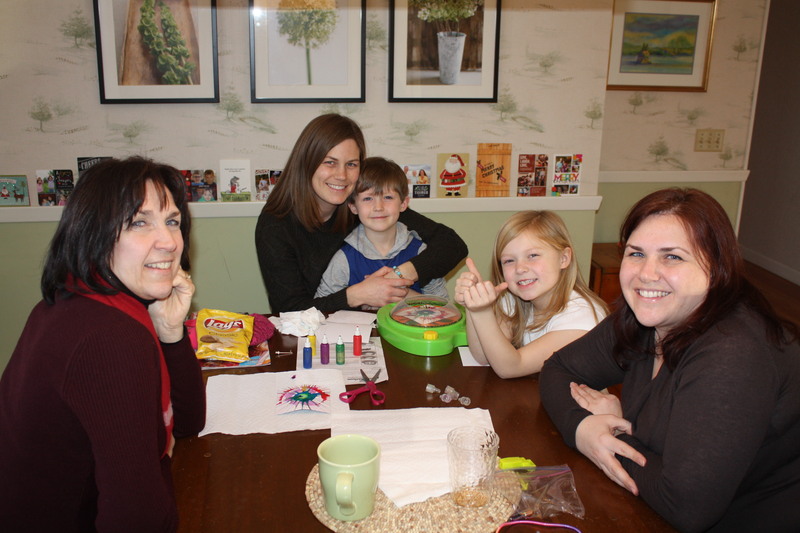 The boys had a lot of fun, and it was nice that many of the moms stayed so we could all get to know each other better. (I have a good feeling about all the mom’s from Cooper’s class. They seem very open and friendly, which is awesome and just what I was hoping for!) But my biggest success of the party was the cake. Cooper had wanted an igloo with penguins and rocks. 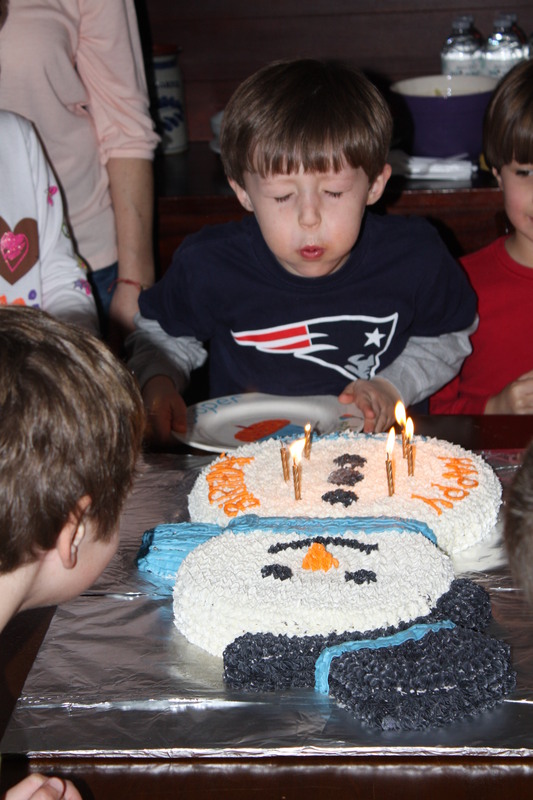 But looking at all the pictures on Google of igloo cakes, I realized it was not going with the snowman theme (and I was scared I would mess it up.) A snowman cake would be much more appropriate! So I found a few inspirational shots, but knew I didn’t want to go too overboard. 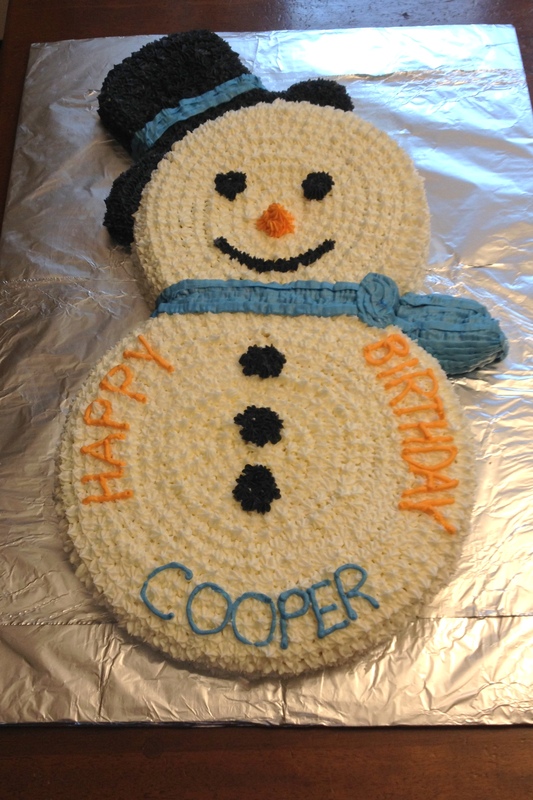 Oh wait, I always go overboard with Cooper’s cakes! Bring it on! 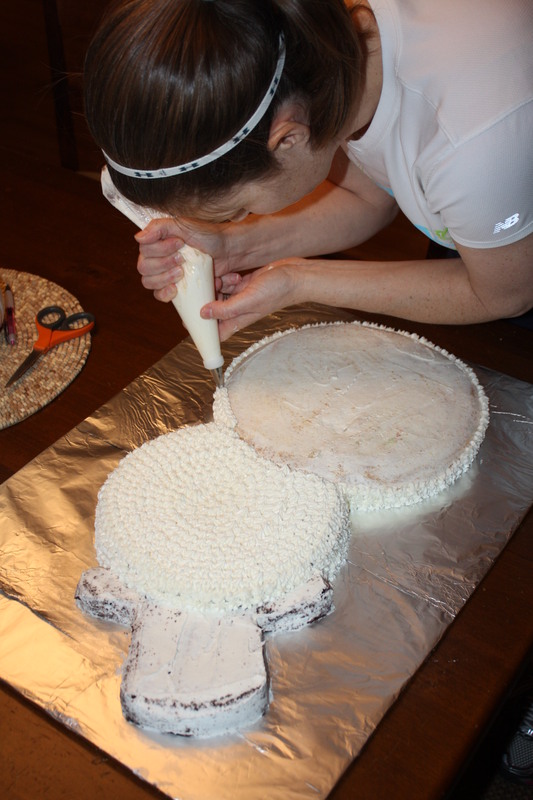 It took quite a while since I individually piped each floret on every inch of the cake. But so worth it! I am in love with this cake! It was a hit with the birthday boy too! Now Cooper’s birthday celebrations are officially over. I’m trying to catch up on his birthday book so that it’s done before March! (It usually sits out for about 2 months before I complete each year.) 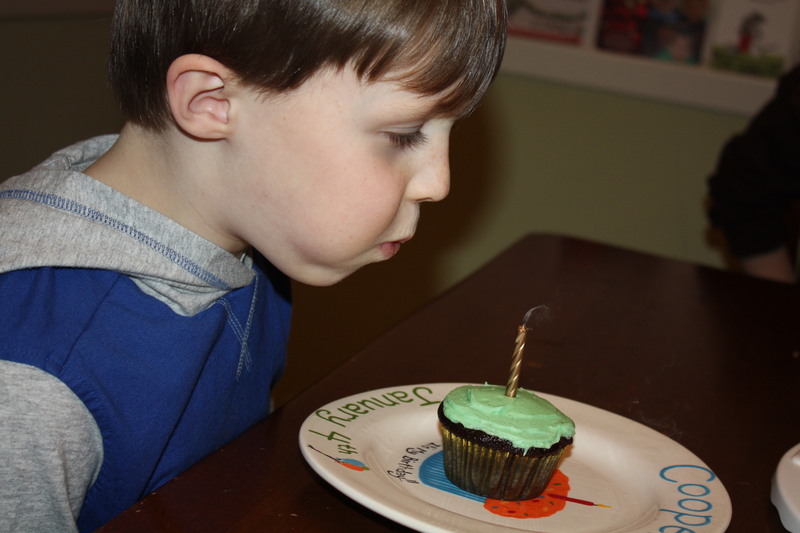 The reality is my baby boy is six, and keeps getting older…. and bigger! His pants keep getting shorter. 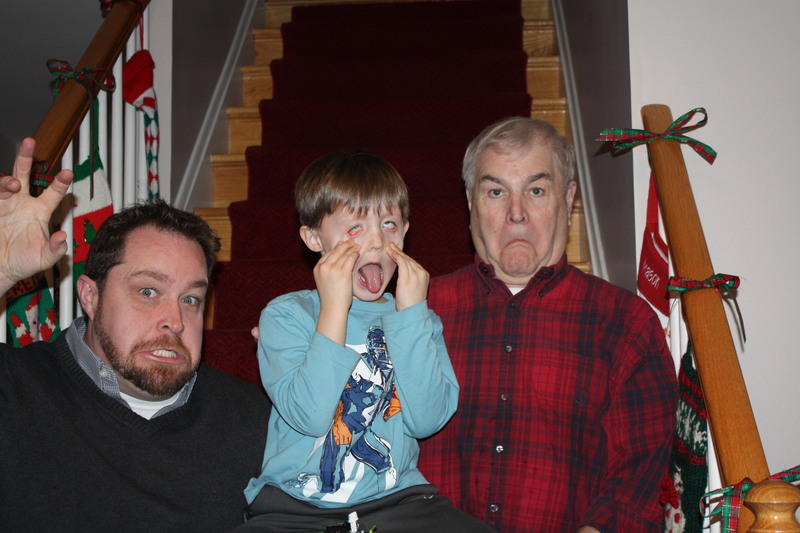 I hope age six brings many more fun memories. But knowing Cooper, I have no doubt it will. Love you, Cooper! Always have, always will! Ok, here we go! The marathon Christmas posts – pictures and all. We started the Christmas break off with the kids’ first sleepover. 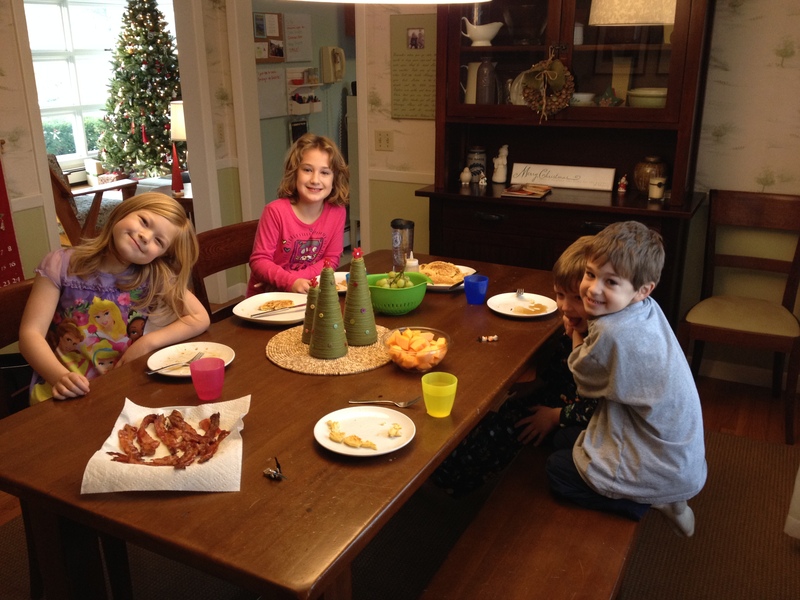 We managed to get through the night with their friends (a brother and sister that live down that street), including a pancake breakfast the next day. Then the weekend was pretty low-key. Getting last minute things done, wrapping presents, baking, having a dinner and cookie decorating party with some other friends, etc. By Christmas Eve, we were ready to go! We decided to stay here for Christmas morning because we want to start creating our own traditions in our own home. It was nice to relax with each other, make the annual cinnamon rolls, have our traditional Christmas Eve fajitas and then open one present before bed. The secret behind a good cinnamon roll? Making a mess! 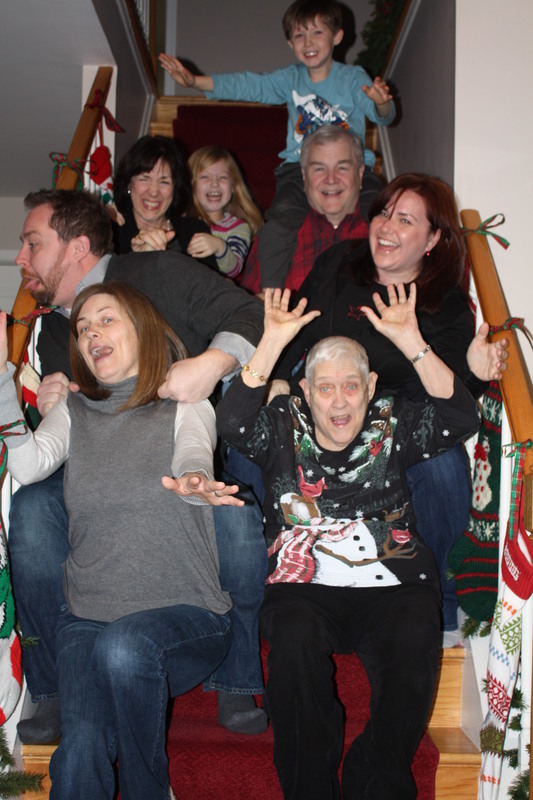 We even took the time to get our the tripod and take a few family pictures. Definitely a new tradition we’ll have to keep up! 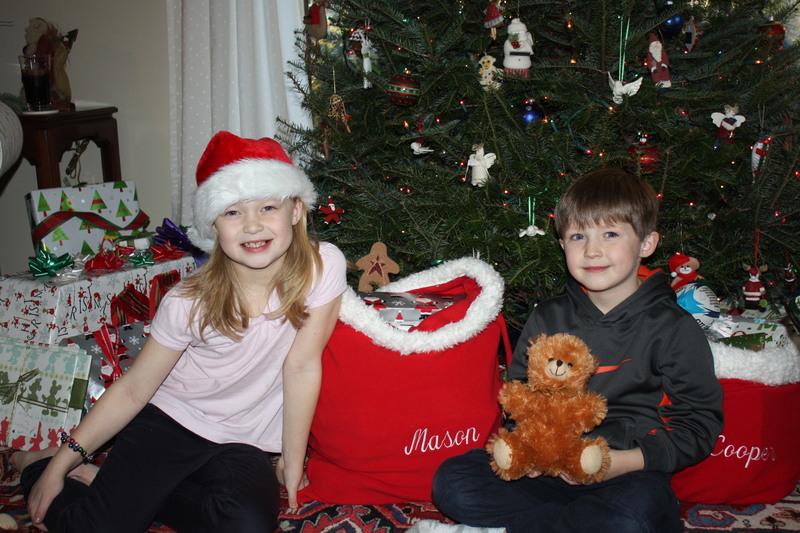 After we got the cookies, milk, and carrots ready for Santa and his reindeer, it was off to bed! I could barely sleep, I was so excited – not only for Christmas the next day, but also to start our travels down to family and friends in Maryland, West Virginia and Virginia. I was just watching the clock, willing it to turn to 6:30 when I could feel ok about being up on Christmas morning. Sadly, I’m not much of a “stay in pajamas” all day kind of person, so Jeremy and I were up and showered pretty early. The kids then went ahead and got dressed, so by the time we sat down to open presents, everyone was fully dressed ready to go. 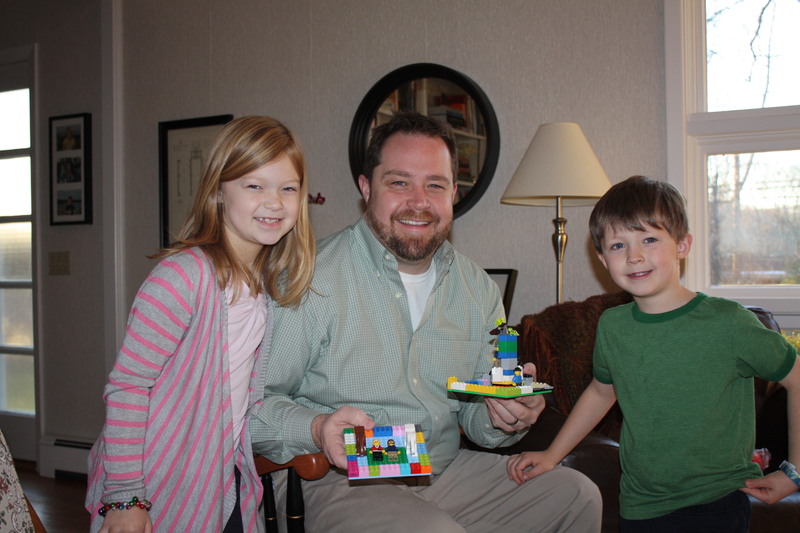 The kids had made original Lego creations and wrapped them for Jeremy. He loved them! 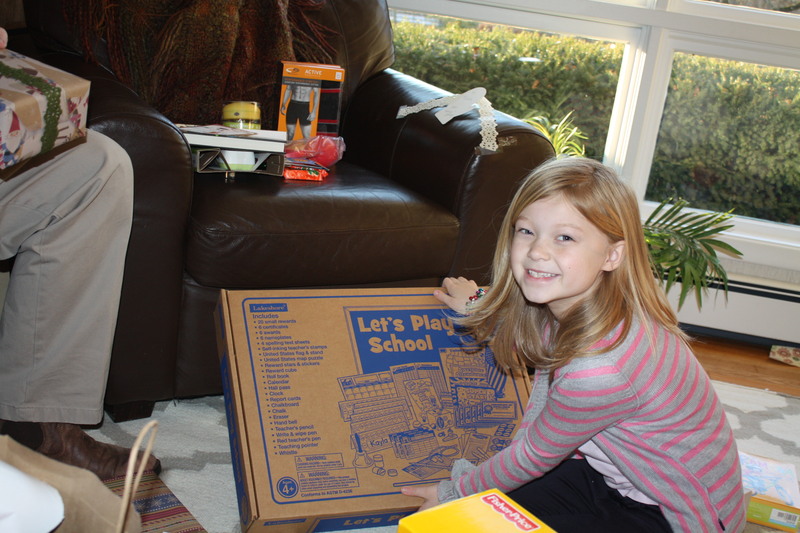 Santa brought Mason a teacher play set. Just what she asked for! 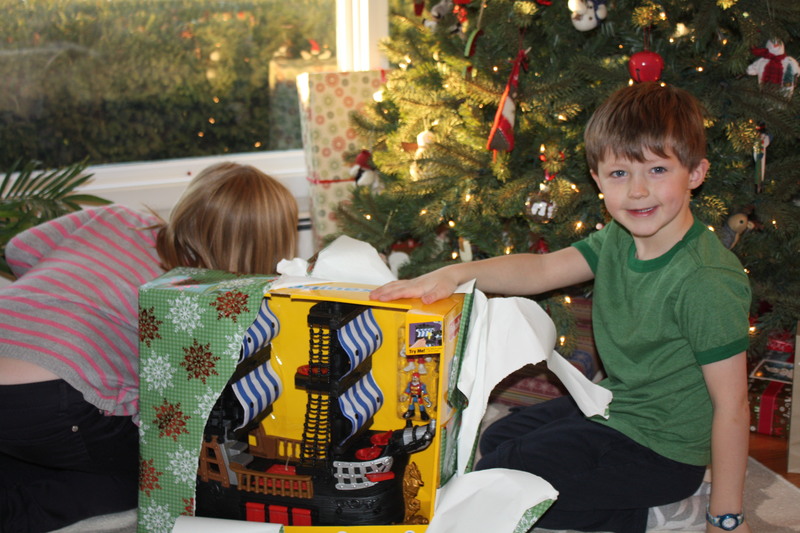 Santa brought Cooper his much-anticipated Imaginext Pirate Ship. 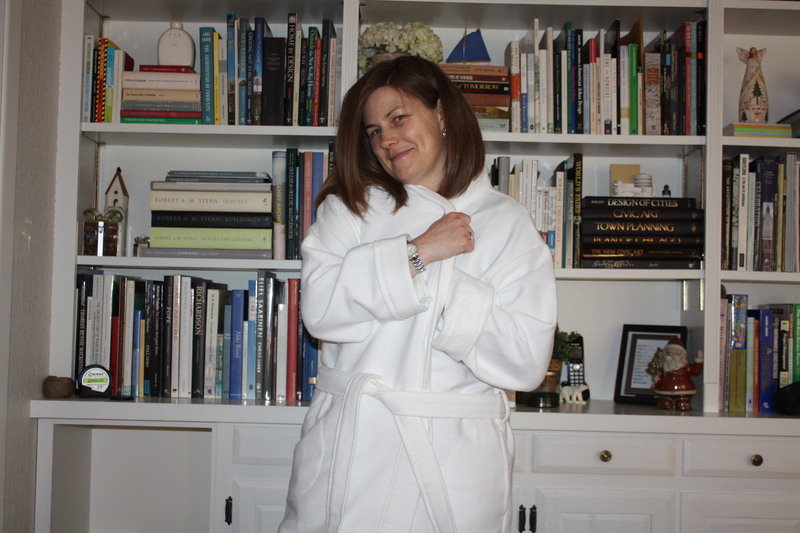 Jeremy and the kids bought me a very warm and cozy robe. So nice! 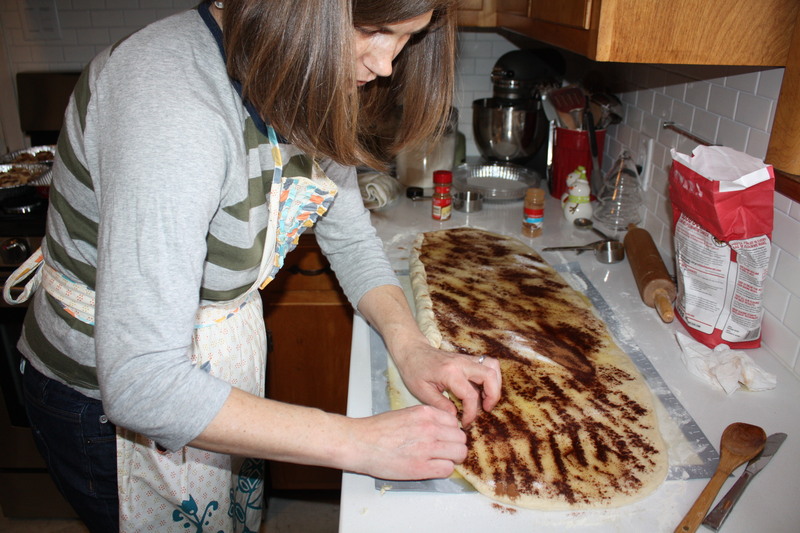 After opening presents, we ate some delicious cinnamon rolls and then loaded up the car. We were on the road by 9:15! Not much time for dilly-dallying. We were just all so excited to get to Maryland and our first stop – The Lakes! Stay tuned for Part 2. It was time. I needed a social media break. It’s amazing how addicted a person can become to Facebook. I was to the point of checking it at least 10 times a day. If I was in between tasks at work, I’d check it. If I was waiting for water to boil for dinner, I’d check it. If I was waiting for my shower to warm up, I’d check it. My life was taken over by Facebook. And it’s not like I even posted all that much. It was just that I was addicted to checking what others had posted. It got to the point where I felt like only 20% of the time was I actually glad I checked it. A link to a funny or interesting article; a great video or some good news or photos from a friend. Otherwise, I was reading people’s posts that I could care less about; that I haven’t really “talked” to in years! Or I was feeling bad about myself because my life was not as “good” as people were portraying their lives to be. And then I’d worry about what I was doing wrong or what I was missing out on. And last week (with the help of a conversation with my sister), I realized that what I was doing wrong was checking Facebook too much. And what I was missing out on was MY life. No, it may not be as glamorous as others’, but it’s great for me. It’s MY life, and I need to appreciate it. I need to focus on it. I need to relish in it. So I deleted the app off my phone and iPad. I deleted the bookmark in Chrome. It will take a lot of effort for me to actually check Facebook. It’s been 2 days, and I’m doing ok. I feel like I’m missing out on something, but I’m sure that feeling will subside soon. And honestly, I’m still checking Instagram because I only follow family members, a few friends, and bloggers. So in a way, I’m still connected. But without Facebook, I am gaining time in my day and time with my family. I’m able to focus on what’s really important instead of what people on Facebook think is important. I don’t know how long this hiatus will last. Hopefully I can detox from the addiction of Facebook enough to be able to slowly introduce it back in and only check it every once in a while. I’ll plan to really clean it up so that I’m only following those that I want to and that have a positive impact on my life. It’s MY life, and I want to live it actively, not passively. I want to live it positively, not negatively. Call it a new year’s resolution or just a change in lifestyle, but I definitely think it is long past due and very much needed for me.